When you approach to an exhibition installed the voice guide transmitter, you can hear the voice description of the exhibition through the earphone connected to the Voice Guide receiver you take. Evaluation Kit for KDDI’s CDMA communication module. You can test developed commands easily from PC. 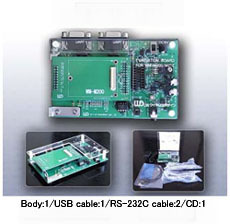 In addition, using the kit, you can execute Modem communication via USB and RS232 ports. 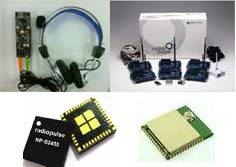 Several ZigBee products developed by RadioPulse in Korea. As extended feature, Voice CODEC and High Speed Communication are available. 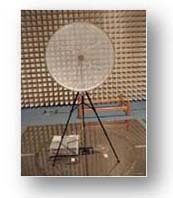 We provide a radio characterization of products incorporated wireless deice. With evaluation of wireless device at the design stage, it is possible to perform smooth operation of the equipment. Adjustment is required after development when designing a wireless system. By simulating pre-First of all, it improves the efficiency of the design. Simulated the indoor environment and outdoor environment on the PC, by using various diffusion model and antenna patterns are available in advance, we simulate with highly accuracy in 2D and 3D. The simulation is carried out working with our partner, Johokobo Inc. Copyright 2009 Wirelessdesign Co.,LTD. All rights reserved.